I can hardly believe it’s 2015, it feels like any other day. I am on vacation in eastern Washington visiting my in-laws. I go back to work on Monday. I’ve enjoyed spending time with friends and family while overindulging in lots of home made meals. I have ate more food then I care to admit and I’m looking forward to getting back on track. These photos were taken last weekend on a very cold and windy day, so excuse the wild hair. 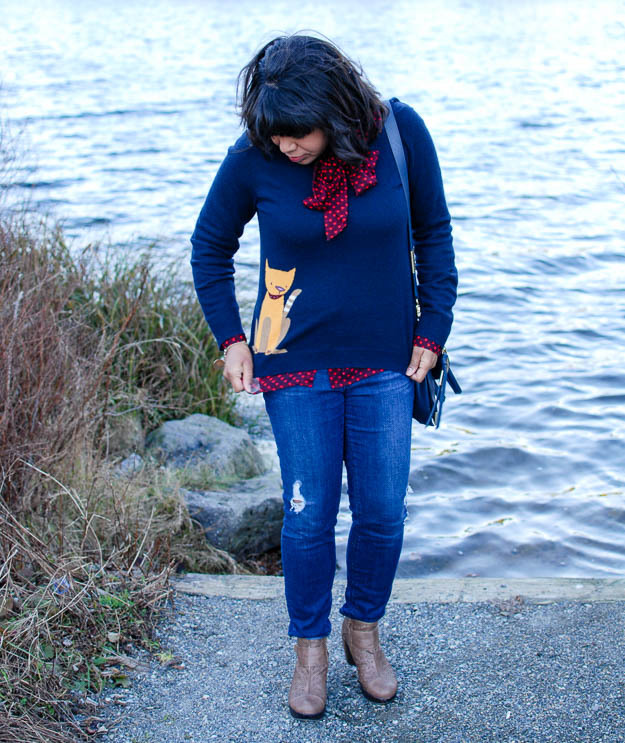 I’m wearing one of my favorite sweaters with an adorable cat critter. 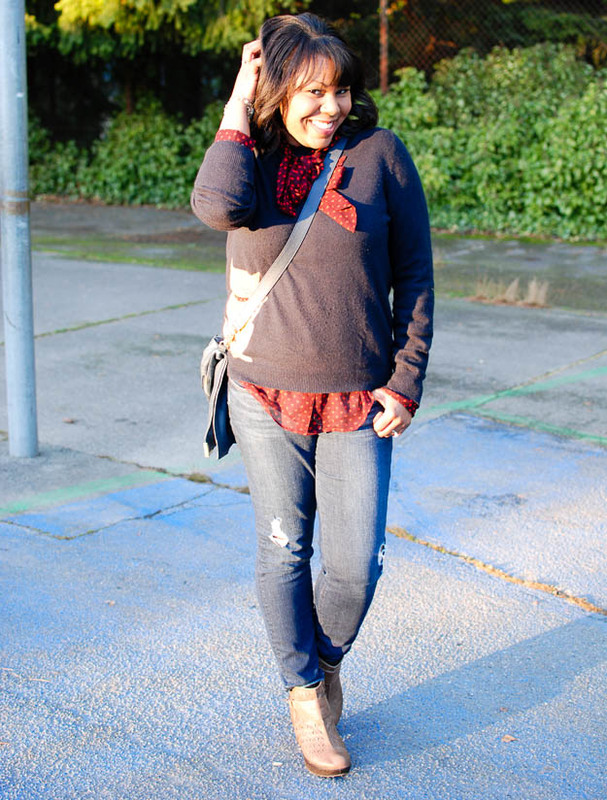 This is one of many J.Crew novelty sweaters in my closet. 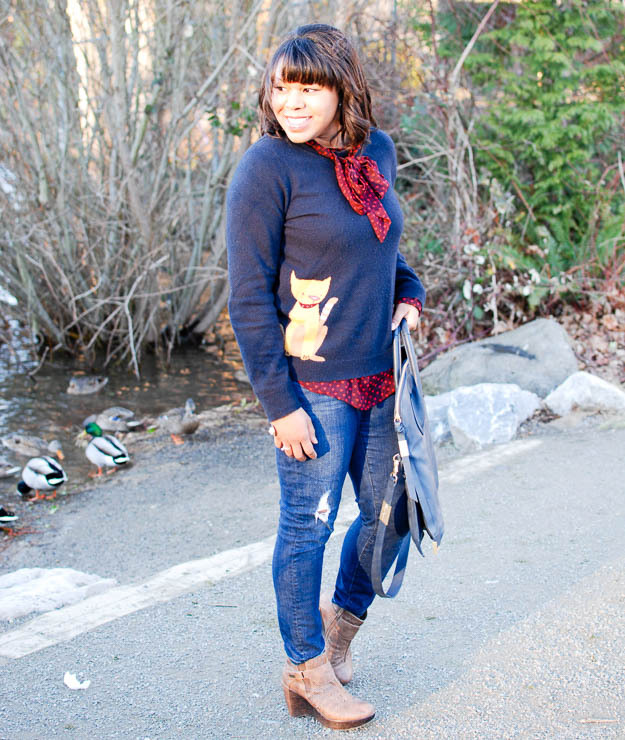 I styled this sweater with a bow blouse. The bag is by Foley + Corinna and can be worn two ways. I was excited about this purse when I purchased it on sale last summer, but this is the first time I’ve used it. I am terrible about rotating my bags – something I need to get better about. Happy New Year, Asa! Love that bag! 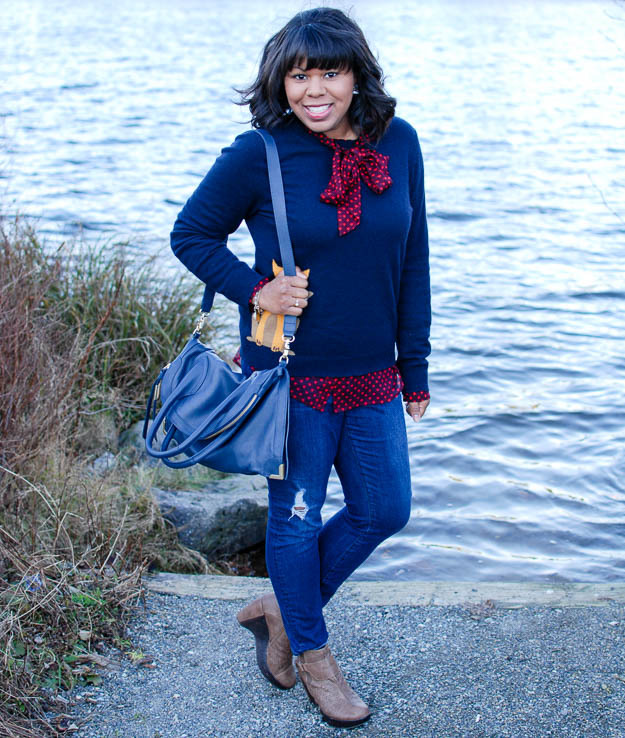 I really like your hair.the over all look is so feminine.the critter sweater over the bow blouse is adorable,love the colors too.I also love the hand bag so stylish.I like your style. I love everything about you outfit! I really need that cat sweater like yesterday. I really love the outfits you pull together. 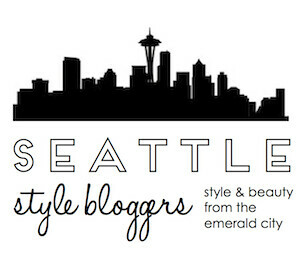 Oh i wish that J Crew sweater was still available! I would SO get that for my girlfriend!!! 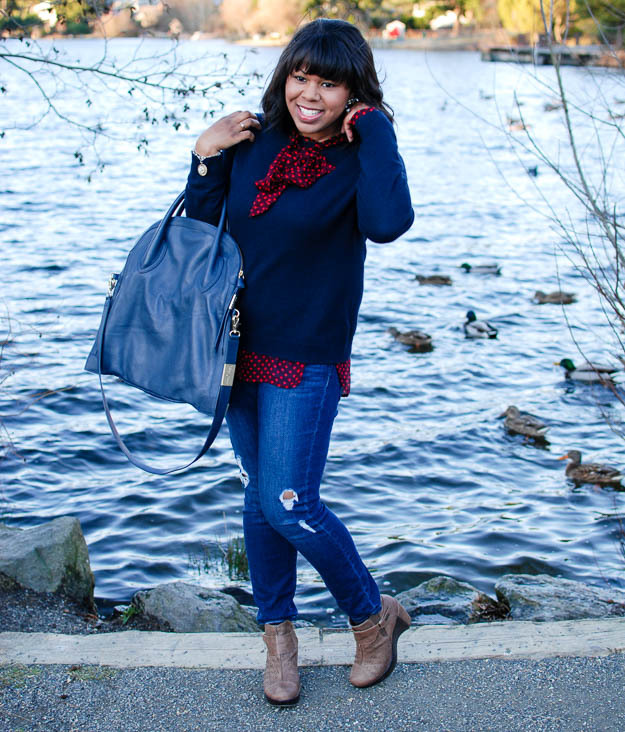 Adorable outfit – you’ve balanced out the navy and crimson so well with the taupe booties! It was definitely a must-have. Thanks for the lovely comment. Thanks Caitlin. I’m the same way with my leather tote bag. It’s great for every day. Happy New Year Mil! Thanks so much. 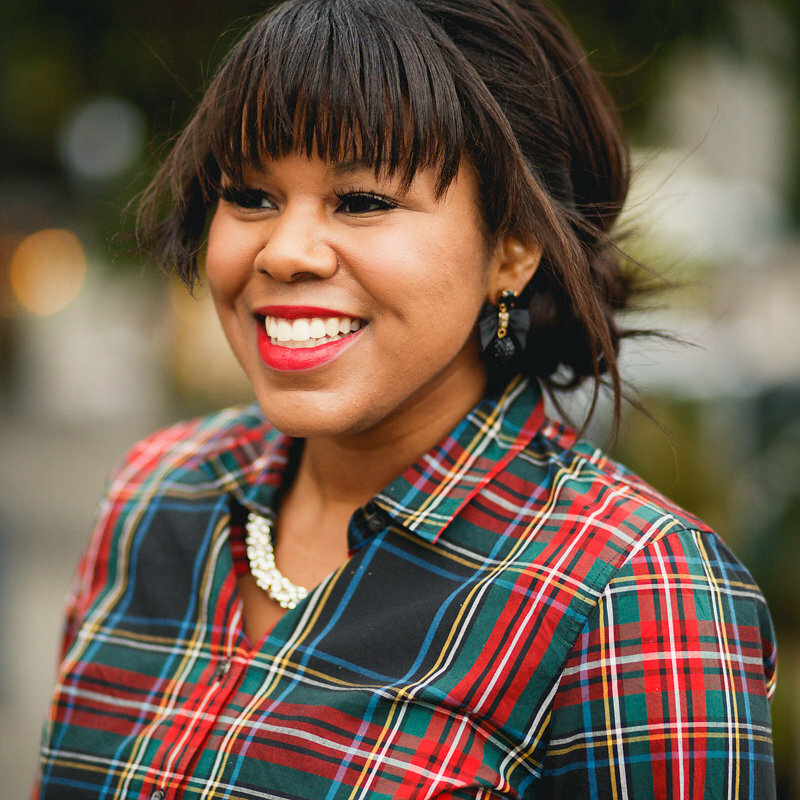 The bow blouse is so cute, and I love the way you’ve layered it here! I too am horrible about rotating bags – I end up using my worn down longchamp every single day… oops! Thank you for the lovely compliments. You’re my biggest supporter and best friend. Aww thanks Karen, what a sweet thing to say. Thank you! Thanks Cami. What a lovely compliment. Happy New year! Hope you’re enjoying your time in the states. Thanks Jen, you’re the sweetest! Your comment also made me laugh. I’m more of a dog person but couldn’t pass this one up. I just love your outfit, as always you look amazing! A very happy year to you hun! Guilty as charged! Thanks for stopping by and following. Happy New Year to you too with your lovely blue outfit! Just stunning!! Love this look so much on you!! Happy Monday! !